The amount is double what Mr Cameron put on the table before he walked out of the talks last week. Speaking at Stormont, The 26-County foreign minister Charlie Flanagan said he and British Direct Ruler Theresa Villiers would resume talks on Monday. He said a “very important breakthrough” was achieved on Friday which was “highly significant”. “On Monday I believe we can reach agreement – if not on Monday then a short time thereafter,” he said. However he accepted that everyone was waiting for David Cameron’s response to the parties’ proposals on finances. The partial agreement among the parties has fuelled speculation and spin overnight, with the loyalist Belfast Newsletter claiming there had been a “cave in” by Sinn Fein on welfare cuts, while prominent loyalist Jamie Bryson insisting the DUP had already “sold out” on the issue of sectarian parades. In a statement on Friday night, Sinn Féin’s Martin McGuinness said efforts to achieve a comprehensive agreement have so far been “inconclusive”. However, he said progress hade been made on continued funding for the Six Counties’ public bodies. “Progress has been made and today the five parties have agreed a set of proposals regarding public finance that would enable the executive to use its powers to protect the most vulnerable, and to invest in building peace and reconciliation and welfare safeguards. “These proposals require additional financial support. “There has yet to be agreement on the outstanding issues of identity, parades and the legacy of the past,” Mr McGuinness added. A failure to secure a deal could mean a return to full Direct Rule from London and the dissolution of Stormont, a fate which none of the parties appear ready to contemplate yet. Cameron was castigated in the Irish and British media last weekend when he unexpectedly quit the talks in Belfast over the cost of maintaining the Six County state and its welfare supports -- only to indulge himself at a star-studded birthday gala party for his wife at Chequers that evening. The British Labour Party described the event as an Ibiza-style “rave” party. The five main parties have now asked the London government for two billion pounds in loans and extra funding over a 10-year period. It includes funding for Stormont and other public bodies, a peace investment fund and a panel that would examine the legacy of the conflict. They have also asked the British Treasury to write off “fines” imposed on the executive for its delay in implementing welfare reform. 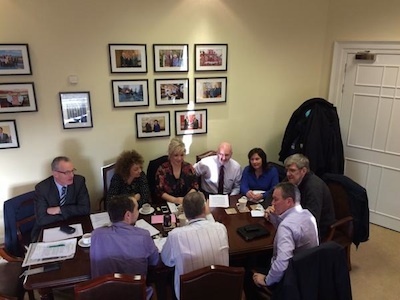 Meanwhile, harsh words exchanged between Sinn Fein and the Dublin government earlier in the week appear to have fallen silent, at least for now. In a sharp Dáil row over the failure to reach agreement, Mr Adams said Mr Kenny should stop posing as a “junior partner” in the talks. He cited a series of issues from previous agreements which the British government had reneged upon, and on which Kenny had not demurred. Mr Adams said these compromises were hard won over many years and the the Dublin government “cannot be allowed to acquiesce or dilute these”. In response, the Taoiseach said Adams had attempted to block a deal during last week’s talks which Martin McGuinness had been happy to sign up to. Kenny accused him of not having the courage to “face up to your political responsibility and do what you have to do” on welfare reform. Mr McGuinness later rejected the Taoiseach’s comments as “laughable”. and “a threadbare attempt to excuse his failure and ineptitude in this process”. Despite the apparent progress at the talks, there are concerns that the negotiations could yet see a repeat of last year’s ‘hothouse’ talks mediated by US envoys Richard Haass and Meghan O’Sullivan when deadlines of Christmas Eve and New Year’s Eve both passed without any agreement. Adding to a sense that time is running out is the looming British general election on May 7. The 2015 general election campaign officially began on Friday, meaning candidates’ spending is already subject to strict rules and limits.